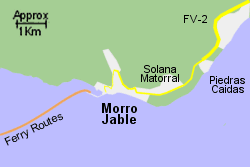 Map of the Morro Jable Ferry Port area. 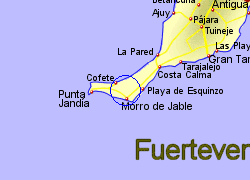 The small port of Morro Jable (also known as Morro del Jable), next to the old town of the same name, lies on the southern most tip of the island of Fuerteventura, approximately 90km south west of the islands capital, Puerto del Rosario and the airport. The FV-2, the islands main trunk road, connects Morro Jable to the capital city, enabling a journey time by car of around 1hr 20 minutes. 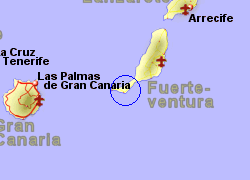 A regular bus service connects the port with Puerto del Rosario at a cost of around 10 Euros. 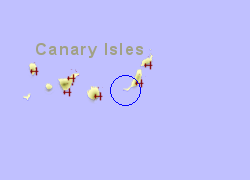 The area is now an important holiday resort, making use of the golden sandy beaches. Operated by Armas with 7 crossings per week, crossing time 2.5hrs. Also operated by Fred Olsen with 17 crossings per week, crossing time 2 hrs. Operated by Armas with 1 crossing per week, crossing time 6.5hrs. Also operated by Fred Olsen with 1 crossing per week, crossing time 1.5 hrs.